Whooping cranes build a nest out of plant stems in a shallow marsh. They lay 1 or 2 eggs; the parents take turns incubating the eggs for an average of 30 days until hatching. The large egg is about the size of a tennis ball. Newly-hatched whooping crane chicks are cinnamon brown. Early on, the parents feed the chick small animals such as snails, earthworms, and insects. Even before their flight feathers have sprouted, young cranes run and exercise their wings to prepare for later flights. At 26 days old, one chick’s parents were observed bringing it 26 food items in 5 minutes! It takes a lot of groceries to make this dramatic growth spurt! 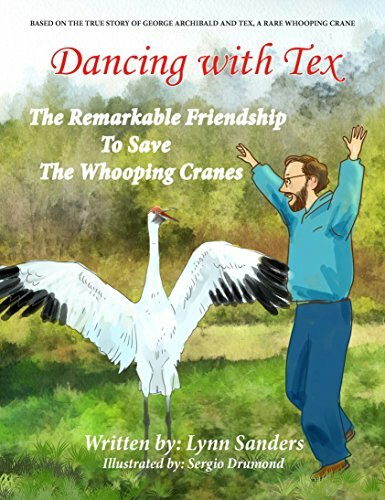 The red on the head of adult whooping cranes and sandhill cranes is actually skin. The feathers are reduced to tiny hair-like structures. The size of this red “comb”, and the color intensity, can be “adjusted” by the bird, to be used as a signaling device—indicating to other cranes its place in the social hierarchy, and its “mood”.